Complete the planner then SAVE a copy of the Reception Planner to your computer. Important Note: The SAVE feature works in Internet Explorer and Firefox. It DOES NOT work in Google Chrome. 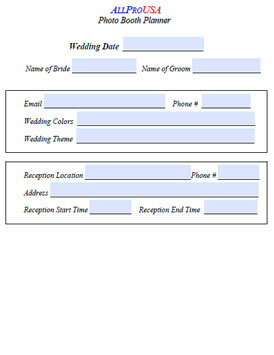 Alternatively, you may complete and then PRINT a copy of the Reception Planner. The Print feature works in all web browsers. 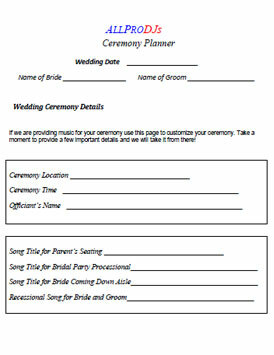 Complete the planner then SAVE a copy of the Ceremony Planner to your computer. 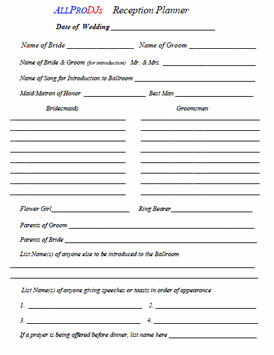 Alternatively, you may complete and then PRINT a copy of the Ceremony Planner. Complete the planner then SAVE a copy of the Video Planner to your computer. 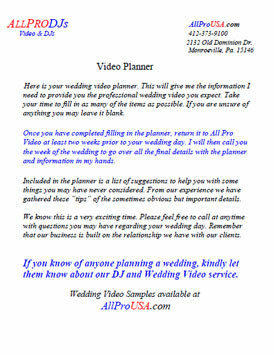 Alternatively, you may complete and then PRINT a copy of the Video Planner. Complete the planner then SAVE a copy of the Photo Booth Planner to your computer. Alternatively, you may complete and then PRINT a copy of the Photo Booth Planner.